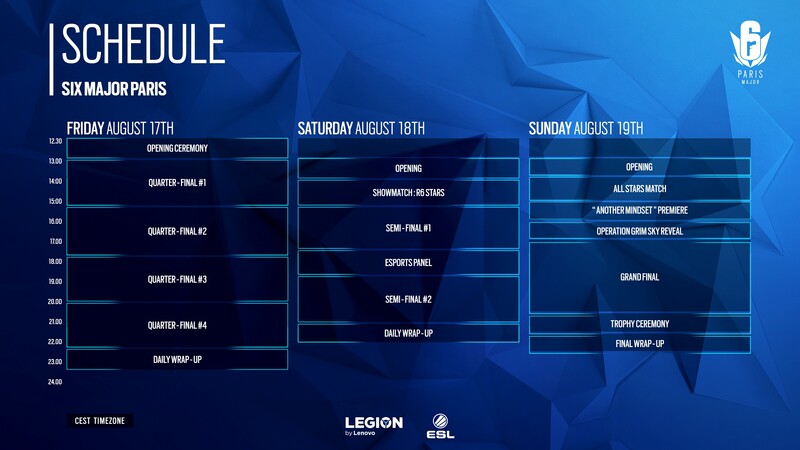 The first ever Six Major kicks off this Monday, August 13th, and we couldn’t be more excited for this action-packed week of competitive Rainbow Six! 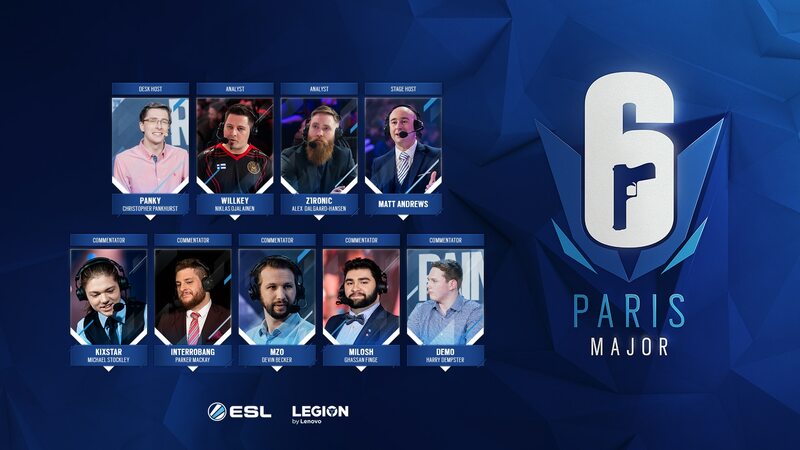 Sixteen of the best teams from across four regions (Europe, North America, Latin America, and Asia-Pacific) will compete during the Six Major Paris for a total prize pool of $350,000! On top of the intense on-stage competition, visitors to the event will be able to enjoy an immersive experience into the Rainbow Six universe. 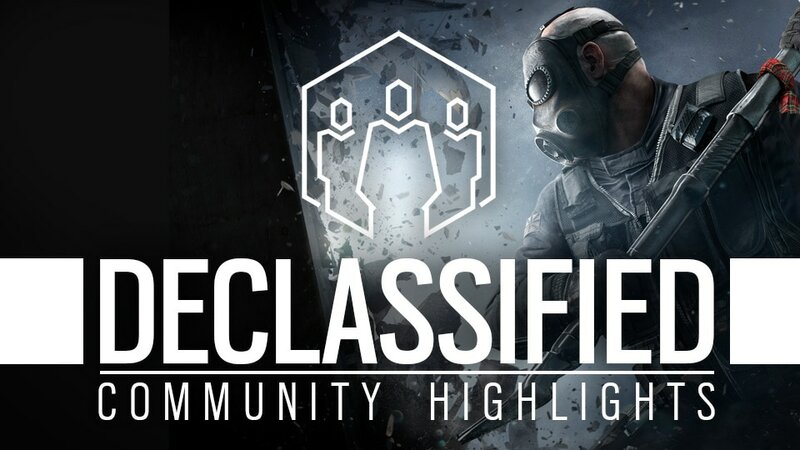 Whether it is your first time watching a Rainbow Six competition or you are a longtime fan looking for an overview of what to expect, this guide’s got you covered! 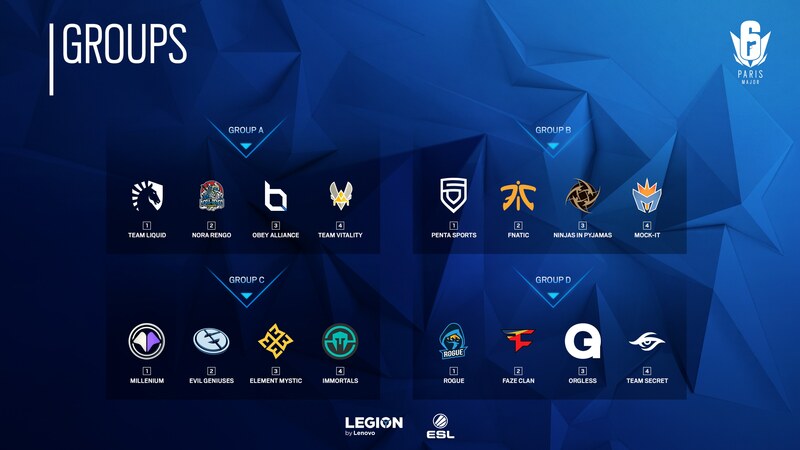 For the group stage, the teams have been broken down into four groups. The results of this stage will determine which teams will advance to the quarter, semi, and grand finals on Friday, Saturday, and Sunday. The event will open to the public on Friday, August 17th. At that point, fans and players alike will gather at the Paris Expo – Porte de Versailles (Hall 4) to watch the matches take place in person, kicking off with the opening ceremony and moving into the quarterfinals. On Saturday, the four remaining teams will battle out in the semifinals, all hoping to be the final two teams that make it through to the grand finals on Sunday. The semifinal matches will be broken up by the esports panel, where members of our esports team will be discussing details regarding the Rev Share program, the Season 8 Pro League finals, and the Six Invitational 2019! Sunday viewers will be able to enjoy the full release of the esports documentary Another Mindset, an exciting show matches, the reveal of our next DLC, and of course, the grand finals match where we will crown the champions of the first Six Major! A meet the pros area: The future of Rainbow Six is bright thanks to our community, and we are excited to gather professional players, fans, content creators, influencers and Rainbow Six: Siege developers in a “Meet The Pros” area. Dedicated sessions will be organized during the weekend. A community fan-art exhibition: We are honored to display the fantastic work that our community artists have created. A celebration of Rainbow Six and its fascinating universe, those arts will be exhibited inside the venue for all of us to enjoy. Drone race: Who hasn’t dreamed of emboding an operator? On-site attendees will be able to participate and prove themselves in drone race competitions. Don’t hesitate to show your skills in order to win one of the Rainbow Six prizes. The Lab: The attendees will discover a zone to customize a jersey and embroider texts and a variety of badges. What are the rules around cosplay? Due to French regulatory constraints, we ask our cosplaying attendees to respect our event guidelines. We are asking that no one be dressed in realistic military outfits in the queue and/or outside of the venue. Therefore, anyone arriving in costume who may be misconstrued as a law enforcement officer, military or other such personnel, will not be allowed to attend to the event. We are also conscious that cosplaying is a constitutive part of Rainbow Six universe. Therefore, inside the venue, we will implement a more permissive environment, allowing our attendees to cosplay. In order to comply with French legislations, we are asking that no one wear a mask/anything hiding a face, bring a replica weapons, wear a GIGN-like attire/or other such French personnel. How will the prize pool be broken down? Please note that all attendees must be at least 16 years of age; those between the age of 16 and 18 will need to present a parental consent form (found below). Parents of the underage attendee will need to sign the form; and the attendee will need to bring it when coming to the event. Because the event takes place in France, the casting in the venue will be done in French. In addition, while the panels will take place live in English, they will be dubbed over for those in the venue by the French casters. The stage hosting and the analyst desk will remain in English. 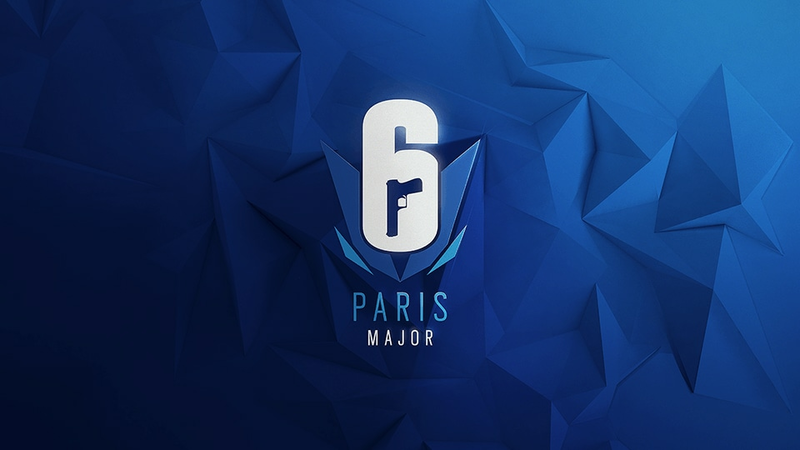 If you’re talking about the event on social media, join the conversation by using the hashtag #SixParisMajor! 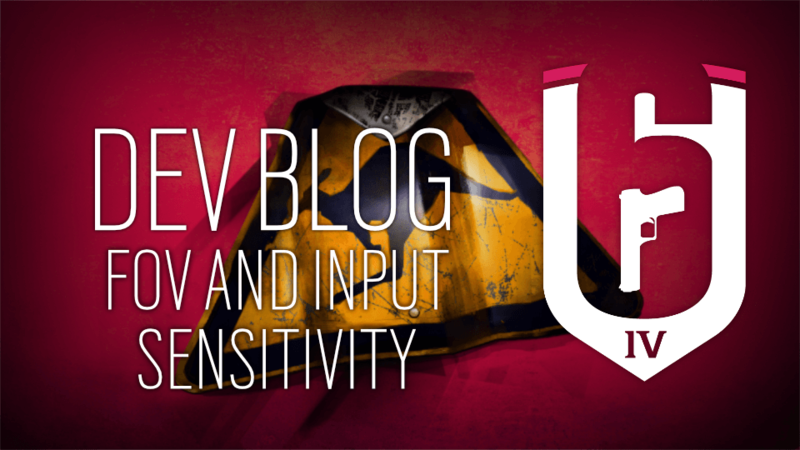 For the latest updates, please visit the Rainbow Six Esports Twitter page or Ubisoft Forums.